Many cities form on the banks of rivers, but that does not mean that city and water are integrated by definition. PhD researcher Claudiu Forgaci investigated how better designed river corridors can contribute to a more resilient and more liveable city. Since 2006, the French capital Paris has been banning the busy traffic off the banks of the Seine every summer, transforming the banks into artificial beaches. Paris-Plages ("Beaches of Paris"), as the initiative is called, is an extreme example of a trend that can be seen in cities worldwide: riverbanks are turned into pleasant, recreational areas with ecological and social value. "A high-quality outdoor space along the water contributes to a healthy city, healthier residents, and healthier recreational opportunities," says Forgaci. "It can reduce the chronic stress that many cities have to deal with." 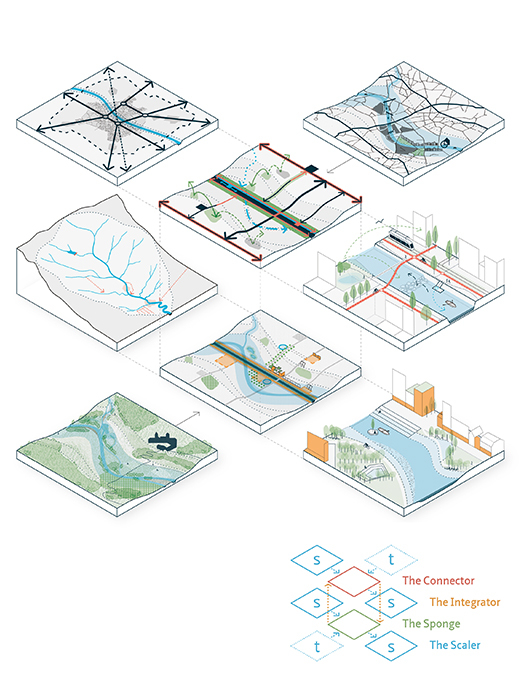 In his PhD research 'Integrated Urban River Corridors', he carried out a transdisciplinary design study in response to four main problems that river corridors have to deal with. Rivers in cities have often become physical barriers as a result of interventions by engineers. These are mostly designed to prevent flooding, but do not always lead to minimisation of the risk. As a consequence of the physical measures, urban rivers have often lost their ecological and social function. In what way could this be improved, Forgaci wondered. In his PhD thesis, he formulates a number of design principles. Armed with these, he zooms in on the situation in Bucharest. Two rivers intersect the Romanian capital. River Dâmboviţa has been channelled in with concrete barriers that cut the centre of the city in two. Most of the river water, combined with sewage, is hidden in an underground channel, while only a small amount of clear water remains on the surface. The second, River Colentina, connects a series of lakes on the northern side of the city. Especially the first river is problematic. Riverside vehicular traffic makes River Dâmboviţa almost inaccessible to pedestrians. River Colentina is more accessible, as the green corridor along the river, already in communist times, functioned as a recreational area for the inhabitants of the city. But just like in the other river, the concrete finishing diminishes ecological qualities. Uncontrolled urban development after the fall of communism and the sale of large stretches of riverbank to wealthy Romanians has further complicated the integration of river corridors and the city. For his research Forgaci interviewed 22 experts from various disciplines about the problems and the potentials of the two rivers. It gives a broad picture of revitalisation options for a city that is addicted to the car and indifferent to ecology and the environment. Should car traffic be banned on one or even on two sides of the Dâmboviţa? It would give pedestrians and cyclists access to the waterfront and create new meeting places. Are there opportunities for green banks and water recreation? Or is a network of green patches the best bet? "Bucharest won't change overnight, but awareness of the importance of spatial quality is growing," Forgaci thinks. "Better integration of the river banks into the urban fabric can increase the resilience of the city. This not only involves reducing the risk of flooding, but also improving the quality of life - for example by reduction of heat islands and pollution or by designing the riverfront as a public space." Forgaci tested the design tools he developed for river corridors in a multidisciplinary design workshop in Bucharest. 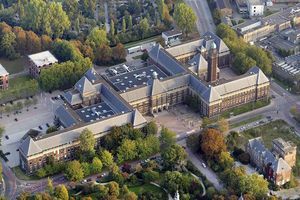 This will be followed up in Amsterdam in March of this year, in the research project ‘I surf’ funded by NWO.